Anne O’Reilly, a lifelong Republican activist, was in the audience here waiting for Donald Trump to arrive Saturday morning. She remains hopeful that Trump can win the presidency but has no doubt what will happen if he doesn’t. The speech was a laundry list of familiar promises on the economy, national security, immigration and other issues, though the candidate’s message was muddled by his assertions of coming lawsuits against the women accusing him of sexual misconduct and his pledges to break up media companies that he said are trying to deny him the presidency. It was ironic that Trump chose Gettysburg, the site of one of the most decisive battles of the Civil War, for his speech. Win or lose, Republicans are probably headed toward a civil war of their own, a period of conflict and turmoil and a reckoning of potentially historic significance. . . . . It will only intensify after Nov. 8. [T]he Republicans face defeat — a potentially sizable one — in the presidential race, along with the possible loss of control of the Senate and the prospect of a smaller majority in the House. Trump’s future is in his hands. Saving the Senate and protecting the House are the priority of GOP leaders. [A] major problem: The Republican coalition now represents growing shares of the declining parts of the electorate — the inverse of what an aspiring majority party should want. By putting together the demographic shifts with changes in party allegiance, the Pew study underscored two big changes — one talked about for some years, the other an ongoing issue for Republicans that Trump’s candidacy has highlighted. Both bode poorly for the Republicans if they cannot adjust their appeal rapidly. In 1992, whites accounted for 76 percent of Democrats or Democratic-leaning independents. Today, whites make up 57 percent. Meanwhile, whites made up 93 percent of Republicans a quarter-century ago. Today, they’re still 86 percent. In other words, there’s been a 19-point shift inside the Democratic Party and only a seven-point shift in the GOP coalition. In 1992, the Republican Party had a slightly younger cohort than the Democrats. Today, the GOP is significantly older in its makeup than the Democrats — and older by two years than the median age. The other big shift is the education levels of the two party’s followers. When Bill Clinton was elected president, Republican voters were in general much better educated than Democratic voters. Today’s Democratic Party followers have somewhat higher education levels than Republicans. Trump’s loyalists want a future Republican Party in which the Paul Ryans and others in the current establishment play a reduced role. Those in the party who have openly opposed or resisted Trump want just the opposite. 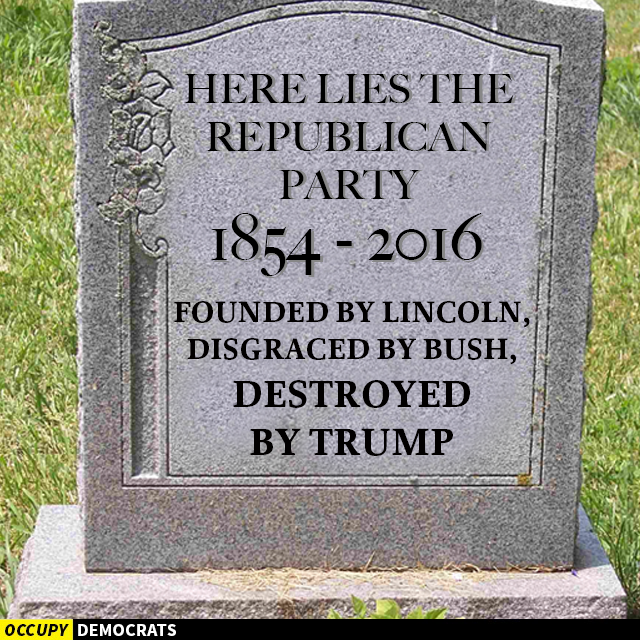 As I have noted so often, I believe that the GOP is past reform. 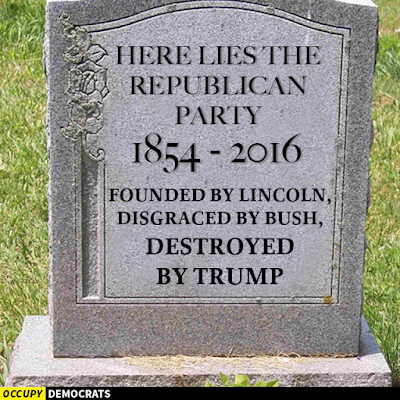 The party needs to die and be replaced by a new party that doesn't embrace ignorance and hate and bigotry.